To help you find a female friendly bike shop, The Cycling Experts have introduced 'Female Friendly' bike shops to the Find a Shop search. Wherever you see the Female Friendly icon, you can be certain that you will find a bike to suit your specific needs and friendly, helpful staff, willing to give you help and advice. 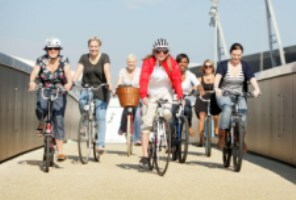 British Cycling's Breeze Network is a national network of fun, local and flexible bike rides for women. The network is designed to help close the growing cycling gap between the number of men and women cycling regularly whilst empowering women to change the face of cycling for good. Events and activities are planned all year round at a number of independent bike shops to promote local Breeze bike rides and offer women the opportunity to try out bikes and kit and ask any questions in an informal, jargon-free environment. We know that many women face barriers to bike riding. Some of the barriers faced by women include lack of confidence, access to bikes, lack of time and family commitments. In response, Breeze has introduced a range of initiatives to support more women to get on a bike or back on a bike. Click here for more information.